Street view of Cameron Village from Clark Townhomes. Clark Townhomes is located less than one block from Cameron Village, home to over 90 shopping, dining, and service establishments. Click here to explore! 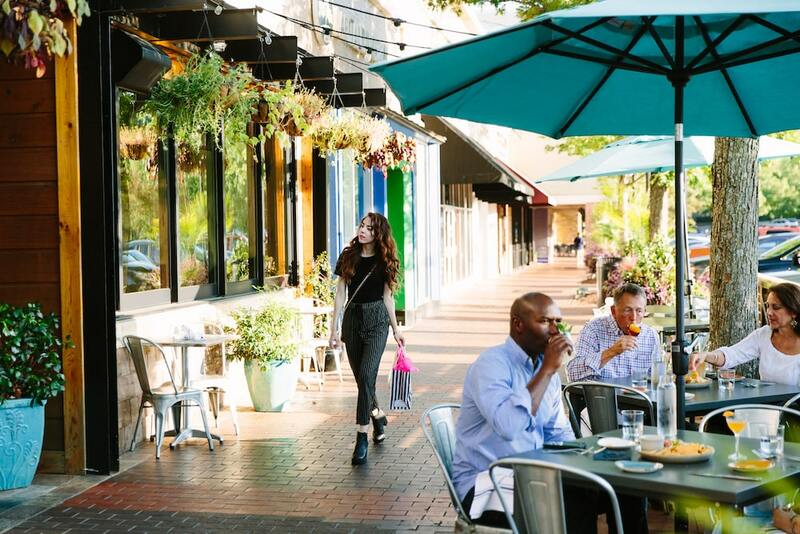 From grabbing a bite to eat to meeting friends for a delectable dinner… Shopping for the perfect outfit to picking up a quart of milk… Taking a spin class to basking in a relaxing massage… The location of Clark Townhomes has you in the hub of it all. For more information on sales for Clark Townhomes, call 919-670-0022. We consider Rebecca Newsome and Constructive Marketing an integral part of our business growth. Rebecca’s expertise and creativity have been instrumental in creating marketing materials that convey the polished, professional image that we believe is necessary in order to connect with new clients. I have known Rebecca Newsome for years now – first as a member of a marketing organization in the Triangle as well as working with her on several projects where we have needed professional articles written which required in-depth knowledge of the promotion and community. Rebecca delivers first class work every time and I’m thankful to have her on our team of professional resources. Rebecca has worked on many projects for me over the last ten years. She has always delivered quality, timely work and importantly–within budget. She has a unique understanding of our business and ability to capture the essence of our needs. Our company will continue to use her talents and will highly recommend her to others. Rebecca has helped us with real estate marketing since 2005. I have worked with her in two new home sales communities and she has also helped my husband and I with our individual business writing articles for the local papers and journals. We always get more traffic on our listings once she has written her awesome articles for us. She has tons of contacts in the business so is able to find whatever it is you need for marketing your business. She is professional and working with her is a joy! Rebecca has worked on countless projects for Preston over several years. She is the most professional, articulate and deadline conscious writer and marketing expert I have worked with. I have recommended Constructive Marketing to others and will continue to do so with full confidence in Rebecca’s ability to deliver! I wanted to thank you for the exceptional expertise and contributions that you have contributed toward getting the marketing and sales program for our new company “kick started”. Despite the nearly 20 years that we have worked together, I am still amazed at how quickly and professionally you can grasp a concept and come up with an outstanding marketing or sales piece. Your talent in this area is unparalleled. I just wanted to write you and thank you for all your help with our MAME entries this year! You are an awesome source and really respected for your input. What a difference you made in our entries. Seriously, Rebecca, thanks so much for your help! You are the BEST! I have worked closely with Rebecca on many projects over the last 12 years, and have found her to be very professional, creative, and detailed. It is a great comfort to know that I can count on her abilities and know she will come through for me with a quality product. I’ve been working with Rebecca Newsome of Constructive Marketing for all my Real Estate Development projects over the past 10 years. The personal interest she takes in each project provides me with the confidence that she is vested in my work. She understands my needs and goals, and is timely and extremely resourceful in developing a program that I am proud to bring to the public. I wouldn’t think of using any other company. Lou Goetz PresidentPark City Developments, Inc.
Rebecca has helped us greatly in launching our new business, HOCOA Triangle. She wrote up our grand opening press releases and had them published in numerous venues; from newspapers, magazines and online media sources. She also has introduced our company to many of her associates and contacts which propelled our company’s presence and name recognition. She is an incredible asset for any company that requires marketing support.